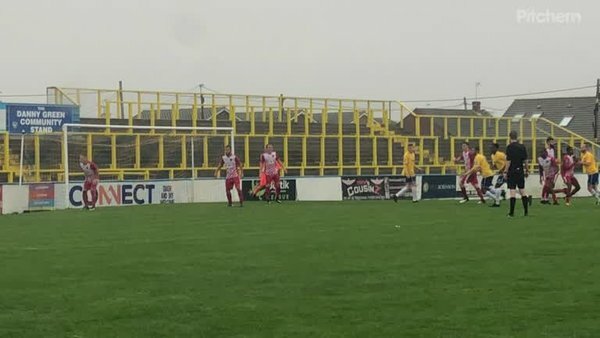 Two late goals saw Canvey Island and Tilbury play out a 1-1 draw in wet and windy conditions at The Frost Hire Stadium on Saturday. Manager Mark Bentley’s first starting XI included a place for James White at centre back who wore the captain’s armband. Jake Jolliffe, Jake Pitty and Ryan Melaugh also came into the side having not started in the previous outing against Great Wakering Rovers 11 days earlier. The first goalscoring opportunity came on 13 minutes when Sam Collins swung in a fantastic cross from the left wing which put the ball on a plate for Jordan Cox to head home from six yards. However, the tall forward was unable to make contact and the ball went across goal and behind for a goal kick. Four minutes later Frankie Merrifield did well to get his head on a corner and direct it goalwards, but his effort was kept out by the man on the post. Josh Hutchinson tried to close down the rebound but the defender was able to clear the danger. Soon afterwards up the other end goalkeeper Harry Palmer pulled off a tremendous save, diving low to his right to tip Lewis Smith’s deflected shot onto the post. Tilbury keeper Rhys Madden was forced into a good save of his own on 32 minutes when Josh Hutchinson unleashed a left-footed shot from 25 yards. Madden dived high to his left and parried the shot away. Hutchinson had another chance in first half stoppage time when he got his head to a corner, but Tilbury captain Lewis Jaggs was back on the line and was able to prevent the goal with his head. The second half was a disjointed affair, with several fouls and bookings meaning that the action was not flowing very well. On 61 minutes a long clearance forwards sent substitute Martin Tuohy in behind the Tilbury defence. Goalkeeper Rhys Madden rushed out of his area but Tuohy managed to poke the ball past him. However, defender Ryan Boswell managed to get himself between Tuohy and the ball and draw a foul from the forward. Ten minutes later another substitute had a good chance to break the deadlock in the shape of Tilbury’s Toby Aromolaran. A ball forwards from the right was flicked on which released Aromolaran and he burst into the box. He attempted to round Harry Palmer, but the keeper did very well to stay on his feet until the last possible moment before going to ground and pulling off a fine save. With the match looking at though is was heading towards a drab goalless draw, both teams managed to find the back of the net in the final five minutes from corners. Firstly on 85 minutes Tilbury midfielder Tom Anderson headed towards his own goal from a corner which Ryan Boswell nodded off the line. Boswell then did exceptionally well to also keep out Ryan Melaugh’s effort from point blank range but could do no more as Martin Tuohy poked home at the third time of asking. The Dockers equalised on the stroke of full time when a corner was only half cleared. The ball was put back in from the left and tucked away by defender Abdus Salami on the front post. Canvey did have the ball in the net once more in the 94th minute, but Jake Jolliffe’s header from a Martin Tuohy chip was disallowed by the assistant referee’s flag.